Sons of Steel, the nation's most exciting steel drum band, delivers red-hot entertainment to music fans of all ages. The amazing energy and rhythm of these six young players is guaranteed to keep you on your party feet. Sons of Steel is certainly not your usual laid back, island band playing simple calypso melodies under a palm tree. These young musicians possess a unique style and with their irresistible mixture of rock, reggae, soca and hip-hop influences, They Make Steel Drums Rock! 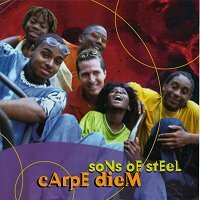 Sons of Steel grew out of a 1998 summer arts camp in Greensboro, NC where the founder, Tracy Thornton, was teaching African drumming and steel drums. Four of his students, Arabian, Adam, Jaren and Jai, ranging from ages 8 to 14, were exceptional. And when their friends were hanging out at the mall or playing video games, they were practicing in basements and backyards on borrowed steel drums. Eventually, Tracy and Nick completed the team that stunned their hometown and soon Sons of Steel were playing to standing ovations up and down the East Coast. Sons of Steel has opened for Lauryn Hill, Jimmy Buffett, for soca's premier band, Machel Montano and Xtatic, and toured with Bob Marley's Original Wailers Band. Last winter , Sons of Steel were featured on the main stage at Epcot Center in Disney World and appeared twice on Univisions Network's 'Sabado Gigante' to an audience of over 100 million viewers worldwide. They amaze audiences and win hearts wherever they go from Miami to New York. Sons of Steel's debut CD, Outta the Blue, was a fantastic success for this young band. With calypso, pop and reggae hits such as High Mas, I'll Take You There and Pass the Dutchie, Outta the Blue established Sons of Steel's party up tempo style. In 2000, world-renowned jazz steel pannist, Andy Narell joined them to produce a dynamic, sophomore CD, Carpe Diem, that included more original tracks by Thornton who played with a rock band for several years and brings that influence to his compositions. " We do what we do and people just love us," says Thornton. "We're not into fads or trends, just great music and having a good time." Sons of Steel lives what they play. These young guys are committed to seizing the day and using every opportunity to spread the gospel of steel drum music. They visit schools, arts centers, summer camps and college campuses teaching about the history of steel drums, the music and the artform. Ellie Mannette, the 75 year old Father of the modern steel drum, is one of their mentors and a loyal fan. Tracy has also traveled to Trinidad and Tobago, the birthplace of the steel drum, to play in 100-member steel orchestras with top players and composers at the largest steel drum festival in the world, The Trinidad Panorama. Sons of Steel's success as a band is based not only on their musical talent, exciting arrangements and energetic performances. It is also based on Sons of Steel's commitment to a core set of principles that include good grades, respect for elders and giving back to their community. On stage or in a classroom, these young artists recognize no limits. Sons of Steel is booked by Partners in Music in Boulder, Colorado and recently signed with Elizabeth Mannette's (Ellie Mannette's niece) New York-based steel drum entertainment company, StrumOn Entertainment. "Sons of Steel has originality, talent and showmanship. Combined with their commitment and drive, they can take steel drum music to the next level" says Elizabeth. "I've spent my entire life around steel drum bands and these guys from Greensboro have a unique quality and style." Only 50 years old, steel drum music continues to excite, inspire and captivate. Now it's time for the music to rise to center stage. And to do this, Sons of Steel is the band of the next generation, breaking new musical ground with a funky, fresh sound.